I left Wedderburn early on the morning of 10th June for Bendigo in order to board a mini bus organized by North Central CMA to visit the Biorich Demonstration site at Lal Lal near Ballarat. The attraction of this project for me was to see at first hand revegetation work which was utilizing the natural habitat design principles laid out in the book “Recreating the Country” written by Steven Murphy. 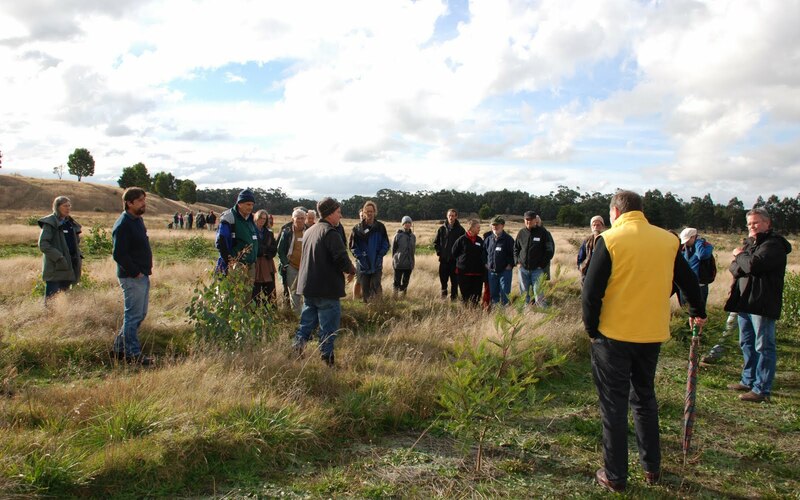 The project, developed in cooperation with Ballarat Region Tree growers (BRT) aims to design and plant a 10-hectare bio-rich demonstration plantation on the kaolin clay mine site owned by Imerys. The site is being established in a buffer zone on low-lying swampland surrounding the mine. This project aims to integrate natural habitat for flora and fauna with farm forestry and thus achieve two goals at once; the harvesting of useful wood based products and the creation of sustainable habitat. connect indigenous remnant vegetation on the site. As part of the tour we were split into two groups with one group viewing the conservation aspects of the site followed by a change over from conservation to production aspects. 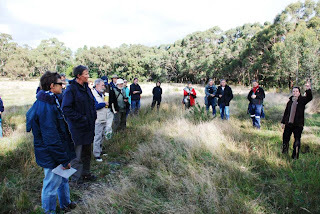 The thinking behind the revegetation concept when compared to previous notions of simply ‘planting trees’ is more sophisticated and aimed at the construction of resilient sustainable habitat. A great deal of thought has obviously been put into planning this project. It is an exemplary project worthy of consideration by other groups involved in natural resource management. It also seems to me that this type of enterprise has great possibilities for encouraging landscape connectivity on private land as the production / commercial /conservation blend would have a wider appeal than conventional wildlife corridors to private landholders especially farmers.